I just updated my HA to 0.86.4 and all my lights and other entities are gone… anybody else having the same problem and know how to fix it? I looked where all the current entities are, and all of the lights entities seem to be gone… I checked the config checker and unfortunately everything seems to be fine. 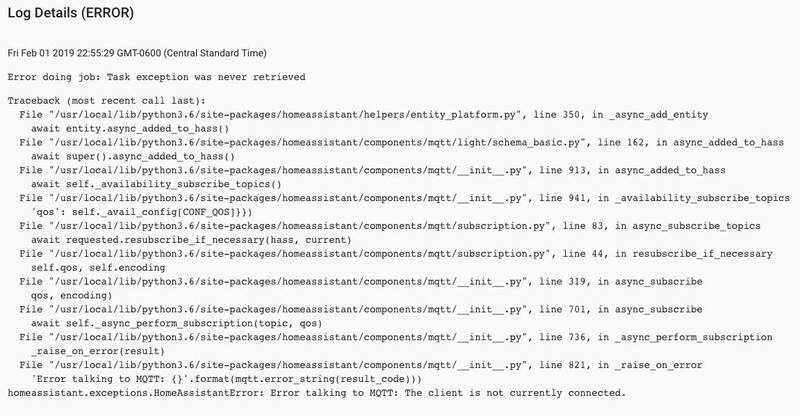 I also noticed that on the info section, I am getting some mqtt error saying “The Client is now currently connected”. Would this be the problem causing the entities to be not available? I also noticed that the “Welcome Home” and intrucduction is gone as well even though the code is still in the configuration.yaml file. Nothing has been changed except the update to the latest version of HA. If you are using the mosquitto mqtt broker addon, try restarting it and then restart HA if required. If you are using the built in broker try restarting HA again. Thank you, @tom_l. I tried doing that, but unfortunately that didn’t fix the problem. It is great to know there is a breaking change, but I’ve struggled to find instructions on what you need to do to resolve the issues caused by the breaking change. Did you get this resolved? Do you have to drop and recreate all your entities?